My goal is to rank on page 1 (preferably in the top half) of Google for terms like “Top CRM Software”, “CRM Software Comparisons” and like terms. What amongst your offerings do you think is best suited to make that happen? Hi Bob, it’s logical to think that ranking #1 for “Top CRM Software” would generate a lot of traffic to your website, and that getting a lot of traffic would get a lot of people to do what you want them to do on your website, but by starting with a specific keyword ranking this can actually lead to less of what you really want as opposed to a conversion focused strategy. How much time, effort, and cost will it take to get a #1 ranking for “Top CRM Software” vs. “What’s the best CRM software for a manufacturing company?” What if it would take 12 months and $120,000 to rank #1 for the first, and 1 month and $500 to rank #1 for the latter? What is the difference in intent of those searching for one keyword vs. the other? What if 95% of those searching for “Top CRM Software” aren’t interested in the service you provide, but 95% of those searching for “What’s the best CRM software for a manufacturing company?” are? By focusing on a few “golden” keywords, which in most cases clients identify as generic, high-level keywords they know will drive a lot of traffic, we can spend a lot of time and money to get less conversions than if we focused on increasing rankings across thousands of long-tail, more specific terms. The key is to start with the desired conversion first, and then let that dictate the best path to get there. 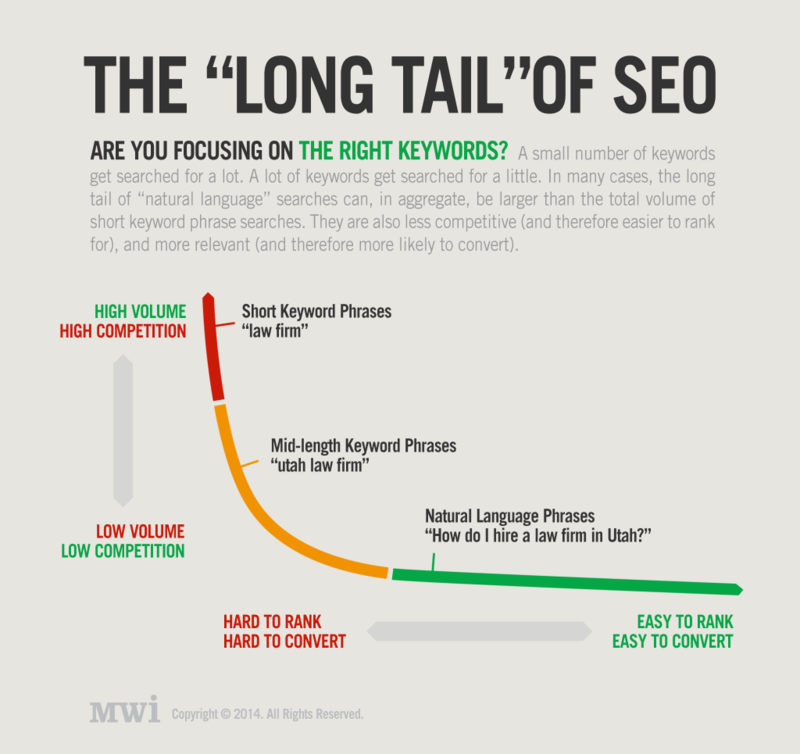 In your case, it’s highly likely that a long-tail keyword strategy is going to produce more conversions in less time and at a lower cost than trying to become #1 for more generic keywords like “Top CRM Software.” The graphic below illustrates how this works. 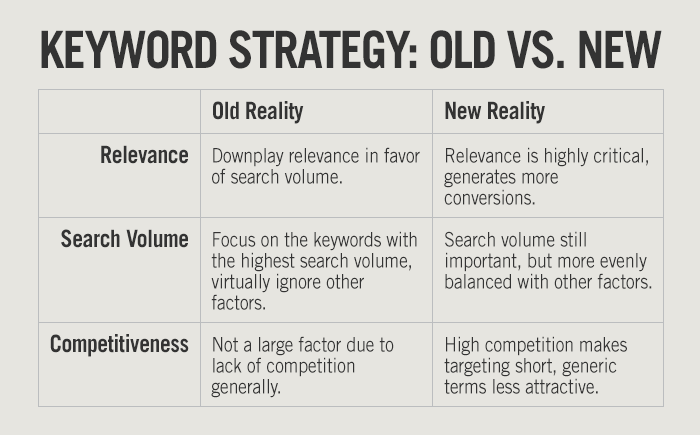 To summarize, the old way of doing SEO was the focus on keywords that are searched for a lot, almost independent of how relevant they are, or how competitive they are. The new reality of SEO is that relevance is highly critical and generates much more conversions. Yes, search volume is still important, but must be weighed against other factors like how competitive a keyword is. Should You Change Your SEO Strategy Because of Google Hummingbird? If you wanted to rephrase the question to be “Which of your services would be most likely to get the kind of people we want to fill out the form at https://yourwebsite.com/fill-out-this-form/?” then I would say that SEO should come first, no doubt about it. It’s the automobile, whereas content creation and social media marketing are gasoline. The analogy isn’t perfect, because SEO by itself will get you somewhere, and so will content marketing and social media marketing by themselves. But SEO is more like a car, and content and social are more like gas. The ideal scenario is to have both, but you’re better off with a car and a little gas than a lot of gas and a car with no wheels, or a website that isn’t being optimized. What questions do you have about SEO keyword strategy? Tell us in the comments below.